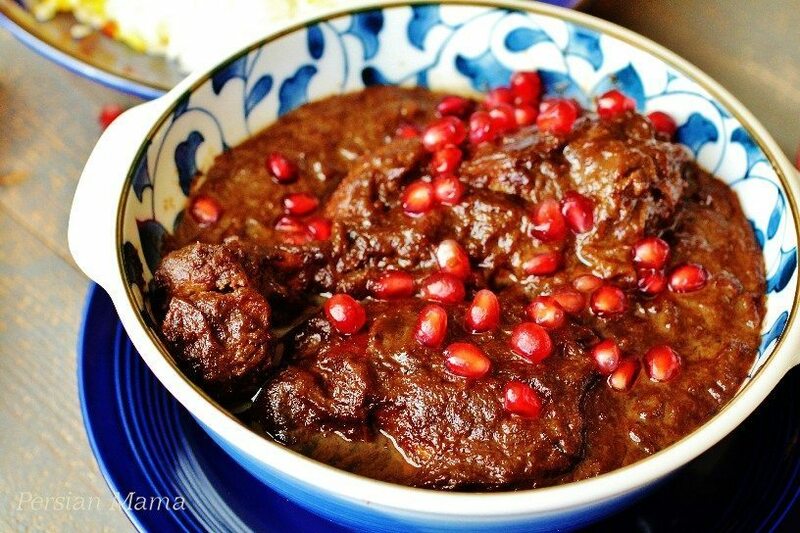 My favorite Persian dish is Khoresh-e-Fesenjoon, a chicken stew with walnut and pomegranate sauce. With the proper ingredients and right preparation, it tastes out of this world. The flavor is like no other. It’s tangy and sweet at the same time. I believe one of the dishes served at God’s Banquet Table will be Khoresh-e-Fesenjoon served over Saffron rice. The recipe consists of two super foods, walnuts and pomegranates. In a rich sauce, the walnut adds a wonderful nutty taste to make all the flavors come together. However, all the credit goes to the pomegranates’ thick syrup or as we call it in Farsi, Rob-e-Anar, which gives the stew its amazing tangy sweet flavor. Having several Pomegranate trees, we make our own syrup. It takes several hours, and it takes a gallon of Pomegranate juice to make about 18 ounces of syrup. But it’s worth every minute of the labor. This is how the stew is prepared. 1. Pick through the walnuts for any shells and add to a food processor and process until it turns to a tan-colored paste. 2. With the food processor running add ¼ cup cold water through the feed chute. Continue processing until the paste becomes uniformly beige in color. 3. Fry the sliced onions with 3-4 TBSP vegetable oil in a 6-Qt stockpot until golden brown. Remove from the pot. 4. Add chicken to the same stockpot and top it with the walnut paste evenly over the fried onions. Sprinkle with salt and pepper. 5. Drizzle the pomegranate concentrate over all the ingredients. 6. Bring to a boil over medium heat. The pomegranate concentrate tends to stick and burn fairly quickly so avoid high heat. 7. Reduce the heat to medium low, cover the pot and simmer for 15 minutes. 8. Now reduce the heat to low and simmer covered for an additional 1 hour 15 minutes, or until the sauce is thickened and the chicken is fork tender and falls off the bone. 9. Stir every 15 minutes or so to make sure the sauce does not stick to the pot. If at the end of this time period the sauce has not thickened enough, leave the pot uncovered for about 10 minutes on low heat for a thicker sauce. Transfer the Fesenjoon to a serving dish and sprinkle some pomegranate seeds on top as garnish. And this is a photo of the final product. But all that means nothing when it comes to actually knowing what the dish is all about. So, what’s missing here? You have not eaten the food. You have not experienced its TASTE. In order to know the Creator, one has to experience or taste him and if you don’t agree with me, the next time you come to my house for dinner, your meal will consist of a picture of Fesenjoon with its ingredients and how to prepare it written underneath the photo.